In October 2011, the European Commission presented the new network of 10 priorities to be achieved by 2030, the "Core Network Europe". It will connect the metropolitan capitals, the regions, the hubs and the ports over the Alps and Pyrenees, allowing the modal shift thereby contributing to the objectives EU CO2 reduction. In October 2013, the corridors have been reduced to 9. In this priority framework, which foresees to achieve by 2030 a 17.500 km network of high-speed / high-capacity rail, the Turin-Lyon takes the central part of the "Mediterranean Corridor" n° 3: Algeciras - Madrid - Tarragona - Seville - Valencia - Tarragona - Barcelona - Perpignan - Lyon - Turin - Milan - Venice - Ljubljana - Budapest. The regions along the Mediterranean Corridor represent an important socio-economic area within the EU. With 18% of EU's population, the Corridor regions generated 17% of the EU's GDP. Economically speaking the most important regions of the Corridor are the Lombardy, the Rhone-Alpes region, Catalonia and Madrid. The main missing section is the new cross-border rail link between France and Italy (Lyon-Turin). The new railway link Lyon-Turin, with the 57,5 km Mont Cenis base tunnel as its main part major component, is the main project of the whole Mediterranean corridor. It is highly strategic because it is the main missing link in the corridor which aims at connecting southwestern Europe with Central and Eastern European Countries. 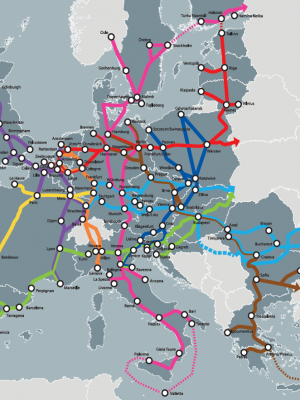 Failing this high-performance connection, transport relations would be hampered, especially for the trade between Spain, France and Italy and the trade between Spain, France and Italy and Central and Eastern Europe. There is a market for rail traffic, but the old Fréjus railway does not match the demand. Freight traffic between France and Italy is relevant, but the rail mode is able to catch only a little part of it: 9% of the total, compared with 29% of the axis German and 64% of the Swiss (2012 data). This is because of the constraints in terms of time and costs associated with the old railway line. In the Italy-France corridor, freight flows are presently confined to road transport or deviated to other routes, causing congestion and generating additional costs. The Swiss Confederation decided, since 1996, to build at its own expense and without financial participation of other States or Europe two rail base tunnels. The total traffic of goods through its territory was only 22.7 million tons, about the half of the goods traffic between Italy and France. TELT - Tunnel Euralpin Lyon Turin, the public promoter which has taken over LTF - Lyon Turin Ferroviaire, is in charge of the completion of the 65 km long international section, from Saint-Jean-de-Maurienne to Susa/Bussoleno. TELT was created the 23rd February 2015 and it is owned by France up to 50% (Ministry of Economy and Finances) and Italy up to 50% (Ferrovie dello Stato italiane). Concerning the financial aspects, the cost of the cross-border section was established at the end of an external cost certification procedure, estimated at 8,6 billion euros (to be financed according to funding keys established by both States in 2012 and with EU’s contribution). To finance the international section of the Lyon – Turin link, Europe will fund up to 40%, Italy up to 35% and France up to 25%. Competitiveness, legality and sustainability have always been key issues for the project. TELT takes the same approach with its admission to the UN Global Compact, which requires strict environmental monitoring and particular standards of oversight with regard to the use of funds. The Lyon - Turin link is also the first example in Europe of an application of anti-mafia procedures, both in Italy and in France. The regulation of contracts, which was approved in June 2016, includes the application of controls to all businesses involved in the project, in both countries. In early December 2015, France, Italy and INEA - The Innovation and Networks Executive Agency have signed a contract for a funding up to 813 million euros for the cross-border section of the work, over the period 2014-2019. The Lyon –Turin railway link represents one of the most important works for the European economic development and companies competitiveness, allowing to reach European markets at lower costs and increase the exchange volumes. At the same time, it will contribute to the preservation of the environment in the Alps, implementing an ambitious modal report policy linked to the commitments of the Alpine convention. The Mont Cenis base tunnel includes two 57,5 km long tubes, 45 km on the French side and 12 km on the Italian side, with about 170 communication bypasses located each 333 meters. Four intermediate accesses, five central ventilation systems and three underground security areas are also planned. Complementary works are currently in progress for the achievement of the infrastructure: three access tunnels are already completed in France, for an overall length of 9 km. In Italy, the Maddalena survey gallery, in Chiomonte, Susa Valley, has been completed in February 2017. Another survey gallery is currently being built down the Saint-Martin-La-Porte access tunnel, where last summer an 11,21 m diameter Tunnel Boring Machine (TBM) started the excavation. The machine will excavate 9 km in order to study the geology of one of the most complex section of the Mont Cenis base tunnel, but already at the diameter and on the axis of the base tunnel. This is just the first step of the infrastructure and during the next years, works will be started on both fronts. Regarding the underground works, besides the entrance at Saint-Jean-de-Maurienne, all the intermediate accesses can be used, so at full capacity, there will be about 15 main excavation faces processing at the same time, in addition to the complex works of the security areas. The progress of works, including the main and secondary galleries, mounting chambers and wells representing a length more than 160 km, being excavated by a mechanized method for around 80 km using simultaneously 9 TBM, the rest will be excavated by the traditional method. One of the biggest challenges in the Alpine area is to control the road traffic by promoting alternative transport systems. The transalpine cargo traffic has doubled over the last 30 years, but the tire keeps its importance if compared to the railway. Since few road passages are available through the Alps, the road traffic has grown exponentially, with a concentration of lorries in few border valleys. This situation is very difficult for the population to stand. Without a proactive strategy to support the railway, the road will continue to absorb most of the traffic between Italy and France. The contribution of the modal transport for cargos is essential to the European strategy aiming at reducing carbon gas emissions. The cost-benefit analysis compiled about the Lyon-Turin project highlights an annual reduction of carbon gas around 3 Mln Tons as an outcome. This result is comparable to the Co2 emissions produced by a city of 300.000 inhabitants. This positive effect is guaranteed by the relocation of 1 Mln lorries from the road to the railway. The project has been designed according to the highest environmental protection and sustainability standards.